This Cinnamon Pecan Breakfast Bundt Cake is an easy breakfast treat. It uses a cake mix as a base, and pudding mix to keep it moist, and an easy cinnamon pecan streusel! Psssst…. 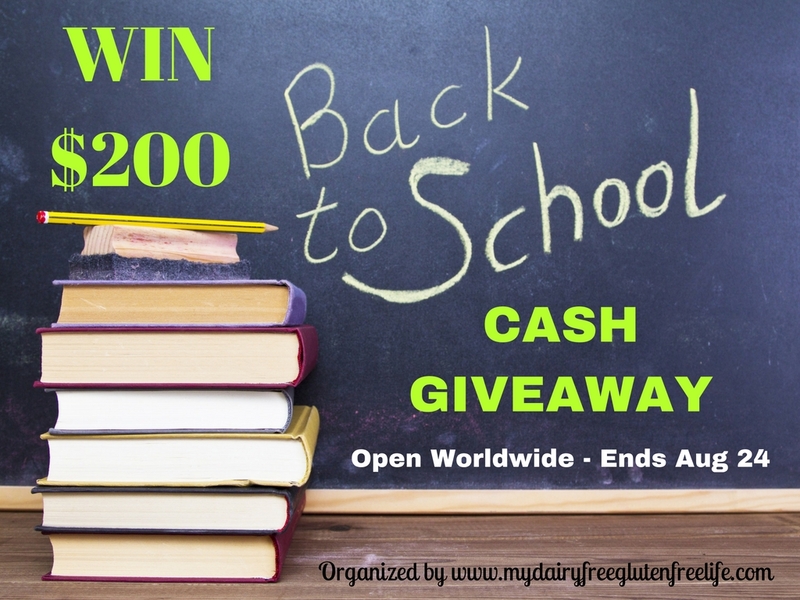 I teamed up with a few blogger friends to give away $200 in PayPal or Amazon cash to celebrate Back to School! Scroll to the bottom of this post to enter the giveaway. Good luck! When we have family visiting us, I prep for huge weekend breakfasts. For my husband’s family, I typically make biscuits and gravy. For my family, we typically do some sort of sweet coffee cake or rolls and an egg casserole. My Mom makes the BEST coffee cake, in my opinion. It’s super crumbly and a family tradition. We typically eat it at Easter brunch. Every year, I tell Mom to “make two” so that I can have plenty of seconds! The last time my parents visited us, I tried out a new coffee cake, this breakfast bundt cake with a cinnamon pecan crumble inside. I loved how easy it was, and I’m in a big bundt cake phase right now. Why not use your bundt pan for breakfast, too? Baking isn’t my favorite, so I love to use cake mixes whenever I can. I even put together a list of my FAVORITE creative ways to use cake mix a while back. This breakfast bundt cake starts with a butter cake mix and adds vanilla instant pudding mix and a few baking staples. It also has a layer of cinnamon, sugar and pecan crumble that you mix in. The frosting on this is what I call the “standard” icing in our family. We put it on everything. Cookies. Turnovers. Cake. Breakfast Bundt Cake! 🙂 It’s very simple, with just powdered sugar, vanilla and milk. I added my frosting to a small ziploc bag and cut the corner off so I could attempt to “artfully” drizzle it over the top of the cake. Mixed results, but A for effort, right? I hope you enjoy this easy Breakfast Bundt Cake! The cinnamon pecan layer is my FAVORITE part of this cake! If you love it, I think you’ll also enjoy my Breakfast Egg Muffins and this Bananas Foster Baked Oatmeal. Mix cake mix, pudding, oil, eggs, vanilla and water in mixer. Add 1/3 of batter to bottom of well greased bundt pan and then sprinkle with 1/3 of cinnamon pecan filling. Repeat two more times, ending with cake batter. Frost with powdered sugar icing while cake is still warm. And because I think that this Breakfast Bundt Cake makes the PERFECT back to school treat, I joined up with some blogger friends for a $200 cash giveaway! You can enter below, good luck! This would hit the spot on any morning for me! I like sweet pastries, or egg casseroles for breakfast when we have house guests, so this delectable bundt cake is the perfect recipe for our family! OMG a bundt cake, for breakfast?? Count me in!! Oh my gosh, this looks incredible – so perfect for company! The best thing about back to school is getting the boys back into a routine! I love cinnamon and pecans in a dessert. I know I’d love them even more first thing in the morning! I love that this uses a cake mix! It looks amazing and so light and fluffy! I love that this cake starts off with a cake mix! Such an easy recipe! Getting back a routine is good. Also, reconnecting with school friends. fewer tourists in my beach town is the best part for me! I love meeting my son’s teachers for the school year it’s always great to connect with your childrens teachers. This cinnamon pecan bundt cake is so delicious. It is moist and the cinnamon and pecans add such a great flavor to it. It is now one of my favorite cakes to have for breakfast. Let me know what you think Vivian! Absolutely great way of starting the day! This recipe gives a chance for starting the day like a king!